Please click on one of the subtitles to be taken to that section of this blogpost. As a note, this is an update to our previous amethyst February birthstone blog post. As you probably know from reading the title, amethyst is February’s birthstone. It is an ideal gift to celebrate an occasion in February because it is both a very beautiful stone and has many interesting meanings attached to it. I mean, who doesn’t like to get a stunning purple gemstone for any celebration? Amethyst is an attractive February birthstone and has been loved by jewellers and historians for years. It is the member of the quartz mineral family and emits purplish hues which sometimes look like deep violet and sometimes appear as shiny lilac. Besides being the official gemstone of those born in February. The name ‘amethyst’ is derived from a Greek word, which means ‘sober.’ You must be wondering what this name has to do with the gemstone and if it has anything to do with the meaning. Well, according to ancient Greek lore, the word has deep meanings. The gemstone was said to protect people from being drunk or lost. The amethyst stone is found in several countries, but its properties and texture differ from place to place. Amethysts are found in many regions, but they are mostly abundant in Uruguay and Brazil. Other countries where you can find pure and quality amethysts are Russia, Canada, Africa, Mexico and the USA. Its colour can take on a darker appearance when paired with darker clothes and can appear as a subtly extravagant jewellery piece. Lower quality stones tend to look a bit more like souvenirs rather than jewellery. Amethyst with gold always looks stunning as the purple gem plays off the gold perfectly. The contrast between the rich purple stones and yellow gold jewellery makes the gemstones look extra special against any dark coloured clothing. When set into silver jewellery the amethyst is a strong contrast. The silver brightens the stone and the silver jewellery typically creates separation between the outfit and the gemstone. This can mean that the silver is more versatile, at the expense of looking a little bit ‘safer’. Rose gold and amethyst is a very unique jewellery combination. It looks particularly luxurious as it is so unusual and gives off a very bespoke and high class image. This gemstone is loved and worn by many famous people and is popularly used in many different metals as a birthstone and celebration present. Amethyst available in many shades of purple such as mauve, lilac, and lavender. The purple amethyst colour evokes thoughts of luxury and quality more easily than most other colours. These are thoughts that are associated with only the best gifts! Historically, the purple colour of amethyst was known for loyalty, and the stone was said to ward off evil and harmful waves attacking a person. You may see some amethyst crystals which have clear or white areas fading to purple areas, or some stones which are milky and not clear. These are low quality stones, mostly found in crystal healing or souvenir shops. Giving amethyst to someone shows care, respect and strength in your relationship. It is also said to protect the wearer from drunkenness, which may be useful for some parties. Amethyst gifts always feel special. Any present of jewellery is sure to be cherished for a long time. Gemstone gifts are among the most well received for any celebration be it birthdays, anniversaries, Christmas or New Year. Think about anniversary rings, wedding necklaces, earrings and rings and jewellery sets gifted on special occasions. The gemstone is always the main part of the gift. This is why it is worth spending some time making sure you buy a quality gemstone. Choosing the right gift for birthdays can be difficult at the best of times. Selecting a birthstone gift makes this choice a bit easier. The more relevant the gift is to the person receiving it, the better it will be received and the more it will develop sentimental value and be cherished. That is why making sure your amethyst gift is high quality and relevant is so important. So when you choose amethyst birthstone jewellery, be sure to pick pieces which use high quality gemstones. Amethyst gifts are unusual as they work equally well as a romantic gift and as a platonic gift. This is because the meanings of the amethyst stones and the colours can be interpreted romantically or not, and they are also quite deep and personal, which gives your gift a feeling of warmth and caring. The first meaning of amethyst is courage. Wishes of courage is deeply personal and a perfect sentiment for a gift in many situations; courage in a new job, in starting a new home or family, at the start of a new year, or reaching a certain birthday. The second meaning of amethyst if strong relationships. The sentiment of strong relationships can be interpreted as the strength of a family, the close bond of friends or the strength of love a couple shows each other. Buying quality amethysts is all about the colour of the gemstone. High quality amethysts are typically called A or AA grade and have a solid deep purple colour and no visible banding. Banding in gemstones is clear or other colour ‘stripes’ running through the inside of the stone and is a sign of a low quality amethyst. In other stones it can be more desirable and add to the character of the stone. Although amethyst is quite common in high street jewellers and healing/ spiritual shops, the amethysts in these shops are usually of lower quality. Low quality amethysts are more pale and grey and will often have a mixture of grey and purple in the gemstone. You may find these are surprisingly inexpensive for quite large stones. Amethysts usually have very few inclusions, so this should not be a factor, and those with inclusions should be a very cheap price. When you are buying an amethyst, take a moment to evaluate the colour and also be sure to take it’s thickness or depth of the gemstone into consideration. Remember big thick gemstones with good colour are not necessarily good quality gemstones. This is because the light has to pass through more coloured material than it would in a thinner gemstone. So if you are comparing two purple amethysts and the purple appears to be the same, look at the depth of the stone – the thinner stone will be a higher quality gemstone and all other things being equal, that is the one you should buy. 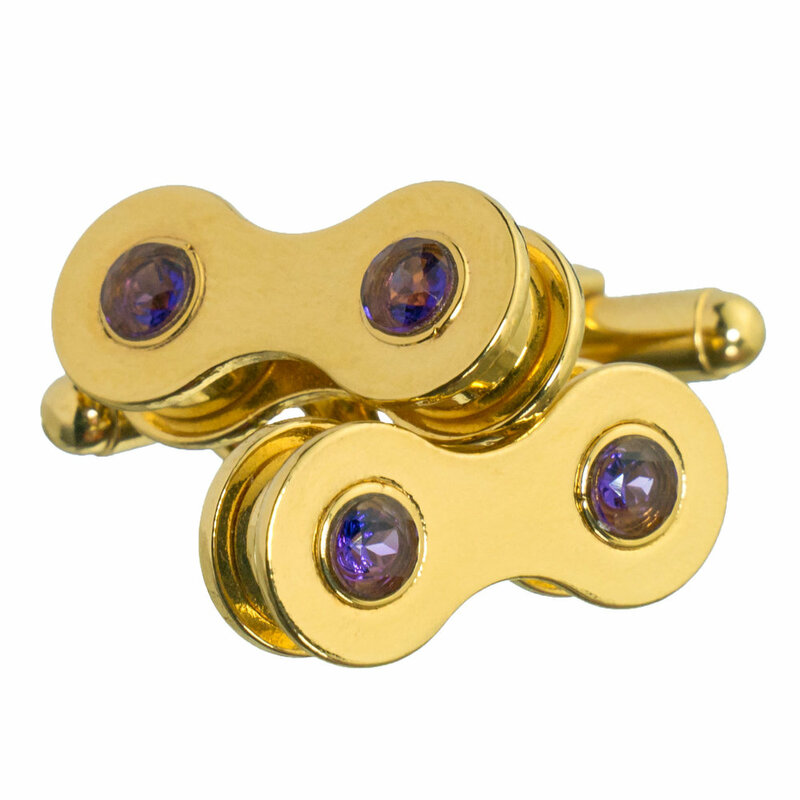 Hasso uses amethyst in its bike chain cufflinks and only utilizes AA grade stones of a deep, rich purple that have been ethically sourced. You can shop for high quality amethyst cufflinks with Hasso.